aGupieWare: Shoot For The Moon Or Pollute The Moon? New Company Leaves Your Stuff On The Lunar Landscape With "MoonMail"
Shoot For The Moon Or Pollute The Moon? New Company Leaves Your Stuff On The Lunar Landscape With "MoonMail"
Thanks to a proposed Mars mission as well as various private ventures, human spaceflight seems poised to have another renaissance again over the coming decades. Yet one of the great goals of our space endeavors always looms up there, staring at us with its giant moony face. That's right, the moon itself is still a space goal for some, and now, you can't quite go there...but your stuff can. According to perfscience.com, the Astrobotic company is developing a "MoonMail" service whereby you can send a capsule full of Earth crap up to what Buzz Aldrin called the "magnificent desolation" of the moon. The company, which is chasing the $30 million Lunar X Prize from Google, plans to launch in the next two years and are currently seeking Earthling donations for small "capsules." "This is pretty cool, but I feel like I should have brought my lucky Darth Vader figurine to leave as tribute." Astrobotic's CEO John Thornton proclaimed, "Today marks the beginning of a new kind of participant on the moon: the individual. MoonMail is a new offering allowing anyone in the world to purchase space on our lander and immortalize their important keepsake on the moon forever." Just don't plan on sending up a ton of stuff...space space comes at a premium. With a small (.5 inch) capsule space starting at $460, a .75 inch space at $820, and an inch clocking in at $1,660 (plus added fees for height), you're not going to be able to send grandma's whole urn or too many photos of your ex, so pick something really special. No, you can't buy a capsule large enough to send yourself, sorry. We all want to go moon cruising, just wait a while longer. A free capsule is being offered as a prize to anyone who can come up with the best idea of something to send via MoonMail. The deadline for these epic ideas is December 23rd. The Google Lunar X Prize that Astrobotic seeks is part of a campaign to consider the moon as the "eighth continent" and to explore it accordingly. The $30 million winner will have to get a robot safely to the moon, move around for 500 meters in any direction, and broadcast back their results. This is all intended to continue the mission set forth by Americans with the Apollo missions, visiting our galactic neighbor in peace for all mankind. Well, now, with pieces from all mankind. 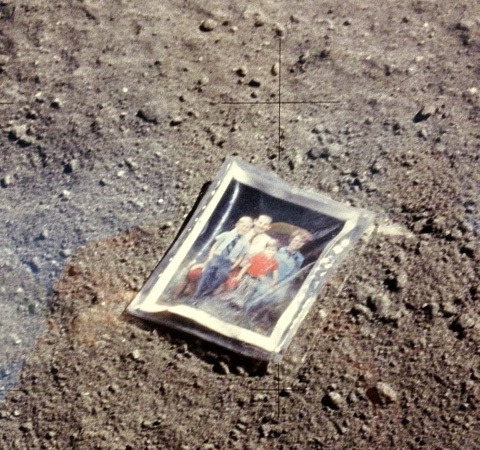 There's already a few bits of real estate claimed by the family photos of Apollo 16 astronaut Charles Duke, but your cheesy selfies could be next!